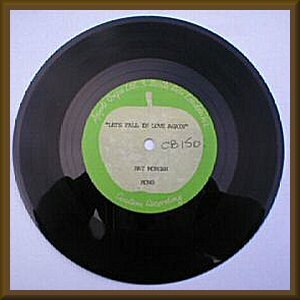 THE SOURCE - Acetates - Apple - Ray Morgan "Let's Fall In Love Again"
or even the artist. It's on Apple, so I've included it. This disc was auctioned on eBay. That info is presented here. ULTRA RARE ONE SIDED APPLE LABEL ACETATE. THE RECORD IS BY RAY MORGAN ENTITLED "LET'S FALL IN LOVE AGAIN" AND WAS RECORDED IN MONO. THE RECORD ITSELF WAS ULTIMATELY NEVER RELEASED AS A SINGLE - SO THIS IS AN EXTREMELY RARE ITEM OF APPLE MEMORABILIA. THE RECORD IS IN MINT CONDITION AND PLAYS BEAUTIFULLY.